KEVIN Rudd will warn people smugglers he stands ready to create an island from hell in Papua New Guinea housing 10,000 asylum seekers. Amid predictions the Prime Minister's PNG solution is sinking as people smugglers gamble on Australia quickly running out of room, the government will confirm it stands ready to fund a dramatic expansion of capacity. Mr Rudd also announced yesterday he had struck a deal with the Pacific nation of Nauru to process and settle a modest number of asylum seekers expanding the PNG solution. The Sunday Telegraph can reveal, however, that Australia has also identified a massive new site on remote Manus Island in PNG that could house 10,000 people. Confirming a dramatic expansion of PNG facilities was possible, Immigration Minister Tony Burke said one site alone had the capacity to hold "10,000" asylum seekers in a tent city. "The new sites we are looking at are proof that there is no cap on capacity," Mr Burke said. "Anyone who thought that people smugglers might be able to overwhelm this policy will be confronted by these plans and realise just how serious the government is. "There is no point getting on a boat any more." 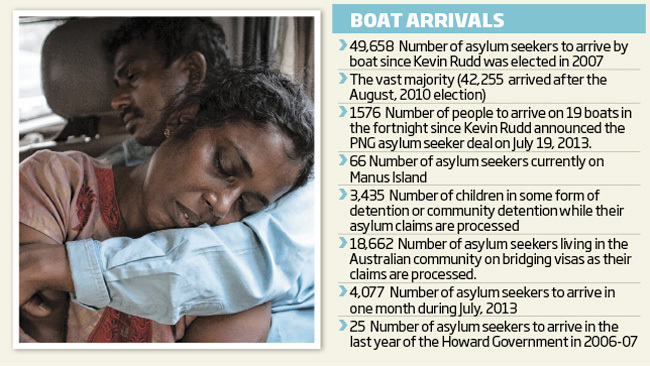 Another boat carrying 44 people arrived yesterday, taking the tally of arrivals since Mr Rudd announced his PNG deal to more than 1600 people in a fortnight. Mr Burke's warning comes just days after he attacked Coalition plans to expand facilities on Nauru to house up to 5000 asylum seekers. By putting an upper limit on capacity, Mr Burke said Mr Morrison was telegraphing to people smugglers a target to hit before capacity was exhausted. Labor argues the 10,000 figure for PNG is not an upper limit. The Sunday Telegraph first revealed a fortnight ago the Prime Minister's hopes to expand the PNG deal to other pacific nations in the region. Yesterday Mr Rudd confirmed it with Nauru President Baron Waqa. Australia expects to provide $30 million in aid to the nation. "Implementing these sorts of arrangements with people as ugly as people smugglers is always hard," Mr Rudd said. "(But) Those folks are not going to be allowed to settle in Australia." The Coalition said the Nauru deal was "much ado about nothing" and Mr Rudd's obscene $30 million advertising binge on his boats policy would make our major retailers blush. "Rudd's $30 million taxpayer-funded pre-election advertising campaign to sell his unravelling PNG 'deal' would make Coca-Cola blush," Mr Morrison said. As both sides traded blows over the economy, shadow treasurer Joe Hockey said Labor's claims Tony Abbott planned $70 billion in spending cuts was "like Lucifer giving a lecture on morality". Greens leader Christine Milne took to Twitter to suggest Nauru could not cope with an influx of asylum seeker arrivals. "Nauru has no food supply except fish. All fruit and veg is frozen and flown in from NZ and Australia," she said.